Product #20605 | SKU JB01301 | 0.0 (no ratings yet) Thanks for your rating! The black with charcoal Pro Sling Strap for DSLRs from Joby is a thin and lightweight, form-fitting, retractable strap for people with t-shirt sizes from S to L . It holds, and provides instant-access to, your DSLR with a battery grip and a telephoto zoom lens. As an added security measure, the strap also features a separate camera tether, which provides a second attachment point for your DSLR. 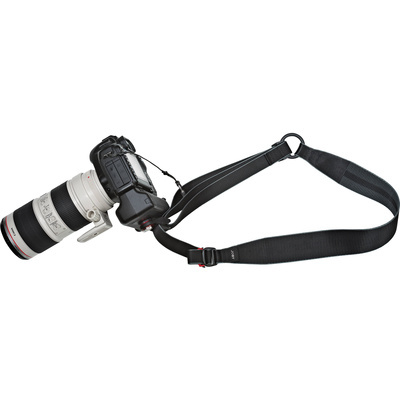 The Pro Sling Strap features an innovative SpeedCinch pulley system, which is a two-part camera retrieval and locking mechanism. First, it allows you to quickly retrieve your camera from an adjustable and retractable strap across your body. Second, it allows you to lock your DSLR at your back, preventing your camera from swinging and bouncing around. To return to shooting, simply unlock your camera and draw it forward in an upward arc motion; the strap doubles in length as the smooth material allows you to bring it up to eye-level. The strap can be attached to your DSLR via a universal 1/4"-20 tripod thumbscrew. To quickly mount your camera with Pro Sling Strap to a tripod, you can first attach an optional Joby quick-release Ultra Plate to your camera. For comfort carrying the strap, the strong materials work to evenly distribute the weight of your camera away from your neck and shoulders.